Overall: The Frigidaire side by side refrigerator FFSC2323LS is a great basic side by side refrigerator for someone who really wants to add a bit of style to their kitchen without breaking the bank. The price on this counter depth was quite surprising to us. While it does come with some nice features and has a very low cost, it is not Energy Star rated and something to be aware of. High Style at a Comfortable Cost: If you are looking to make your kitchen look fresh and new the best way to do this is by adding a built in refrigerator. 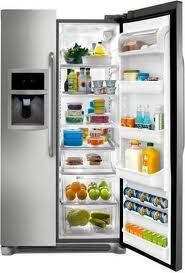 These refrigerators can be quite pricey, until you take a look at the counter depth refrigerator models. They offer a very similar appearance for almost half the price. Extra Energy Efficient: Frigidaire added a feature they call the EnergySaver Plus that puts your refrigerator into an energy saver mode once it hasn’t been opened for an entire day. Filtered Water and Ice: The PureSource 3 water filter on this refrigerator should make buying water a thing of the past for you and your whole family. Easy to Use Controls: The control panel sits above the ice and water dispenser to make for easy use. No more reaching into the back of the refrigerator to change the temperature.